Featuring 75 cards. Where known, serial numbers are noted. 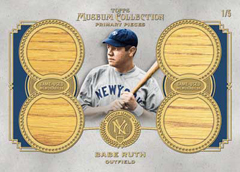 For 2013 Topps Museum Collection Baseball, high-end hits from baseball's best current stars are intertwined with greats from the recent and distant past. Every pack comes with a premium hit. Four-pack boxes deliver an on-card autograph, an autographed memorabilia card, a jumbo relic and a quad memorabilia card. Case hits include an autographed jumbo relic and a Framed Museum Collection Autograph. 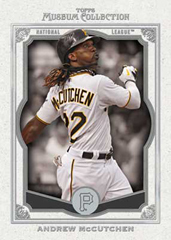 The 2013 Topps Museum Collection base set has 100 cards from past and present players. Included is Ted Williams, who returns to Topps products for the first time since 2010. Three base cards are in a pack. Packs also have one parallel from the following: Copper, Green (#/199), Blue (#/99) and Red (1/1). Canvas Collection inserts return. Numbered to 10, each card features original artwork done directly on the card. Every box also comes with a Canvas Collection Reproduction. 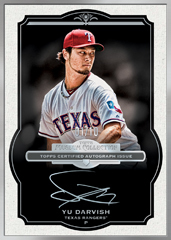 The majority of autographs in 2013 Topps Museum Collection Baseball are part of the Archival Autographs line. All are signed directly on the card. They are also serial numbered with none higher than 399. Gold and Sepia parallels are numbered to 5. Collectors can also find Dual (25 cards, #/15) and Triple Autographs (five cards, #/5) that also have on-card signatures. Among the more than 75 signers are Willie Mays, Ken Griffey Jr, R.A. Dickey, Rickey Henderson, Giancarlo Stanton and Yoenis Cespedes. Popular Museum Collection Autographs return at a rate of one per case. Each comes with a metallic frame. The striking cards use a dark backdrop and are signed in metallic ink. Falling one per case, Gold Frame cards are numbered to 15. Silver Frame cards are numbered to 10 while Black Frame cards are limited to 5. 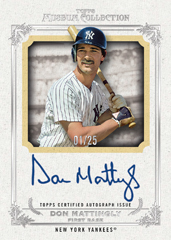 2013 Topps Museum Collection Baseball also has a limited number of Cut Signature cards from late greats. Each is a one-of-one. More than 65 players are included in Signature Swatches, autographed relics that include two and three memorabilia pieces. Gold parallels are numbered to 25 and Patch parallels are numbered to 5. 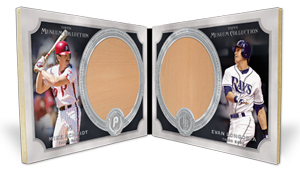 Momentous Materials fall one per case and come with a jumbo memorabilia piece alongside an autograph. Numbered to 10, there are more than 100 players in the set. Mike Trout, Bryce Harper, Stan Musial and Carlton Fisk are among those with cards in the set. Primary Pieces are book cards with an autograph paired with four memorabilia pieces. Forty cards make up the set, each of which is limited to 10 copies. 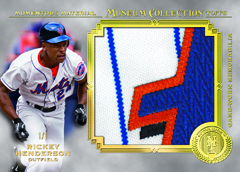 2013 Topps Museum Collection Baseball has several jumbo relics that combine to fall one per box. Momentous Material cards are numbered to 50. All are highlighted by over-sized game-used relics. There are also three parallels: Gold (#/35), Silver Rainbow (#/10) and Gold Rainbow (1/1). More than 50 players also have Jumbo Patch parallels numbered to 5. Momentous Material Dual Jumbo Relics (30 cards, #/5) are book cards with over-sized swatches from two players. Jumbo Lumber cards have massive game-used bat pieces. Numbered to 30, the checklist has more than 50 players. Parallels include Gold (#/20), Silver Rainbow (#/5) and Gold Rainbow (1/1). Dual Jumbo Lumber Relics (30 cards, #/5) use the book card format to offer over-sized bat pieces from two players. 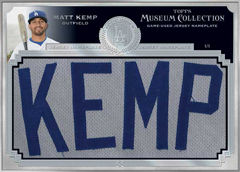 Every box of 2013 Topps Museum Collection has a quad memorabilia card as well. Numbered to 99, Primary Pieces has a checklist of more than 50 players. Parallels include Copper (#/75) and Gold (#/25). Select players also have Patch versions numbered to 5. Primary Pieces featuring retired legends are more scarce, numbered to just 20 with Gold Parallels numbered to 5. A total of 25 different Primary Pieces cards pair up four different legends, each with their own piece of game-used memorabilia. These are numbered to 99. Copper (#/75) and Gold (#/25) parallels are also available, as are 20 different Patch versions (#/5). Adding to the hunt are several levels of unique memorabilia pieces. 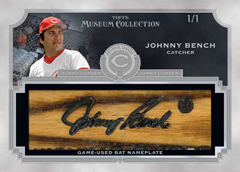 2013 Topps Museum Collection Baseball has 100 total Jumbo Lumber Bat Nameplate Relics. Each one-of-one has the name from the player's bat. 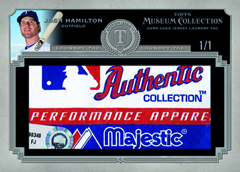 Momentous Materials Laundry Tags include the premium piece of a game-used jersey. These one-of-ones are exclusive to North American cases. A select number of cases have been allocated to Japan. Museum Memorabilia (1/1) cards have unique jersey swatches. Random boxes come with new box loaders. Framed Over-Sized Canvas Collection (20 cards, #/25) come with framed reproduction art. Ten players have autographed versions that are numbered to 5. Twenty one-of-one Framed Over-Sized Jersey Nameplate Cards come with the player's full nameplate from the back of a jersey. Good: Huge checklist, patches and autographs are very nice, amazing MLB Laundry Tags and Jumbo Lumber Relics, smooth-looking base card design. 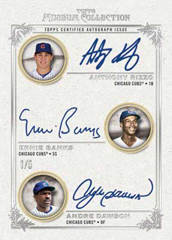 Bad: High price per box, hit or miss product, sticker autographs should not be included in a product like this, only star players should be included among the autographs and relics. The Bottom Line: This product can offer a lot of value to the collector. On the flip side, there's the potential to bust a real dud. This is a high-risk, high-reward product. The different designs, and autograph and relic pieces are very appealing. Given that Museum Collection is a high-end product, the cards are printed on a thick stock. With a mostly white border and a classy picture-frame design, even the base cards have a "museum" feel to them. The parallels are even nicer with a modest change to the border color. While the Archival Autographs are similar to the base and parallel cards, the other hits have a noticeably different look but still maintain the overall theme of the product. The jumbo relic and relic autograph cards are slightly different without a true border on the card. Instead, there is a picture of the player with a blurred background and an ornate frame around the relic. The Museum Collection Framed Autographs feature a black background and an elegant frame around the card. Canvas Collection rounds out the museum-quality of the product, by supplying collectors with a card that looks and feels like a work of art. The checklist spans the whole spectrum of young, veteran, and retired players. While the checklist is limited, it is great to be able to pull young players like Yoenis Cespedes and Anthony Rizzo, alongside greats and former greats such as Albert Pujols, Miguel Cabrera, Bob Gibson and Ernie Banks. The dual cards also present a nice option, pairing up players from the entire history of baseball. There are also several players in Museum Collection that would be considered questionable for such a high-end product. With any hit-or-miss product, monetary value can differ extremely from box to box. But by having a wide range of card designs and players in this product, collectors can still pull historic players and great cards, even if the value is not where some would like it to be. It really is up to the individual collector to decide if the reward outweighs the risk. 2013 Topps Museum Collection is a fun product to break. In each pack, you get three base cards, one parallel card, and one hit. With the great parallels in this product, and the variety of hits, each pack is going to hold a surprise. The biggest appeal of the product is the monster card that might be hiding in the pack. It will not normally be there, but sometimes the thrill of the chase is enough. Any word on when this is going to be available? Mark R � I believe it has shifted to next week now. Bought 2 boxes out of the same case, and pulled the same Auto-jersey card in both boxes. Seems Topps still hasn’t gotten some things together yet!!! It wouldn’t be a bother but at $200.00 a pop, then I think there’s a problem with coalition. Where’s the jersey nameplate for Salty? It’s a pretty set, my one complaint is I pulled a numbered to 5 jumbo patch relic card….that had no piece of patch at all, only jersey. I was disappointed on that big time! John… I hate when that happens. I think that all the card companies should institute some additional quality control to ensure that low numbered “big” game used memorabilia card hits, particularly those that are referred to as “patches” and are from higher end products like Museum Collection, consistently feature multi-color premium patches. One color jersey cards are little more then placeholder hits at this point, with the only exception really being a few hard to find Hall of Famers whose jersey cards have held their value because of the scarcity and price of the memorabilia, thus preventing card companies from flooding the market with them and killing their secondary market value. Mike….Yea if it was a Hall of Famer I would not have carred, but a 2/5 Tommy Milone…thats when I say WTF. I am almost ready to write a letter, because when you spend so much money and get screwed like that, it really makes you want to avoid that product. John � Writing a letter would be a good thing to do. Topps and other card companies do their best to listen to what collectors like and don’t like. It might be hard to see sometimes, but it’s true. If they don’t hear otherwise, trends will likely continue. will � Have you got a link. I remember last year there were a few exclusives intended for overseas cases. will � I found them. They certainly do look legit. I’m looking into it and will hopefully get an official word. Thanks Ryan, I look forward to hearing what your able to find out. If these are legit, I can’t wait to add to my Votto collection! will � A lot of them do seem reasonably priced.